Ritchie Robertson reviews Der Briefwechsel, correspondence between Thomas Bernhard and his publisher Siegfried Unseld. I've singled out a passage for its insight into the the Austrian novelist's stubborn yet playful character. Later in the same article, published in this week's Times Literary Supplement, Robertson takes a look at Bernhard's Meine Preise, a 'posthumously published, highly entertaining account of the numerous award ceremonies he attended'. Both volumes are published in German by Suhrkamp. Siegfried Unseld was the most dynamic publisher in post-war Germany. When Peter Suhrkamp, founder of the Suhrkamp Verlag, died in 1959, Unseld stepped into his shoes, and in 1963 took over the Insel Verlag, an older and highly respected literary press which, decades before, had published Rilke. 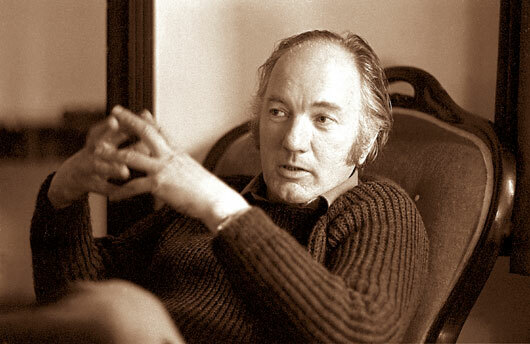 One of the current Insel authors Unseld thus acquired was Thomas Bernhard, whose great novel Frost appeared there in May 1963. Unseld recognized in Bernhard a genius who must form part of the new canon of German-language writers he hoped to create. He may not immediately have realized just how awkward, obstinate, inconsistent and totally unreasonable Bernhard was. But he can have been left in no doubt when, at their first meeting in January 1965, Bernhard touched him for a loan of 40,000 Deutschmarks with which to buy a house. The loan, and Bernhard's evasions about repayment, form a leitmotif in this astonishing and riveting volume of correspondence, which runs from 1961 until November 1988, less than three months before Bernhard's death. For long stretches is a comedy, full of unexpected twists and turns, in which Bernhard sees how much he can get away with and Unseld, despite remonstrances, generally gives way.